I was feeling a little selfish when I decided to make these. I was meant to be baking up something sweet to bring along to a BBQ, but I used it as an excuse to practice piping my heart-shaped macarons (which I have made twice before) before the wedding, plus I felt like making something pretty rather than coming up with some crazy flavour combination. 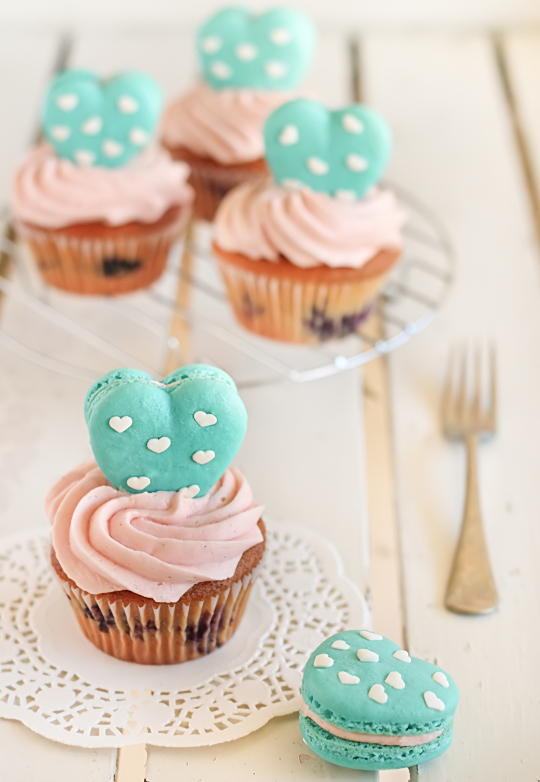 Early in the morning I was determined to make some brightly coloured cupcakes with heart macarons on top. Three hours later, and two inedible batches of hideous failcakes in the bin and I was about ready to tear my hair out. Maybe it was the curse of Friday the 13th, even the simplest things were going wrong. When I'm having a seriously bad day in the kitchen the best thing for me to do is to put my feet up and try again another day. But my stubbornness prevailed and I pushed on, falling back to my foolproof cupcake recipe, which is so easy and never lets me down. At the last minute I decided to throw in 2 punnets of blueberries instead of 1, which ended up being wayyyy too much fruit for the batter. But it still tasted pretty good. Simple, but classic. I made the macarons in a bright teal shade, I love teal. In a random spasm of sprinkle-loving insanity, I grabbed some white heart-shaped sprinkles and dotted them over the surface of the macarons. I wish I had the regular round confetti sprinkles but the heart ones were kinda adorable too. It's probably an unnecessary embellishment, but it's damn cute. It was comforting that my macarons turned out well, considering all the issues I had with my over-complicated cupcakes. Obviously it's just better to keep things simple sometimes so I went with a old-faithful icing flavour; vanilla bean. I whipped up the icing with a ton of vanilla bean, I just love the way the little black dots are speckled throughout the fluffy icing. I also added some natural pink food colouring to the icing to give it a light pink tinge as I was inspired by the pink & teal colour combination of this beautiful cake by Sweetapolita. I'm a little bit in love with how dainty and girly the whole thing looks. These cupcakes and macarons are nothing particularly original or different but it looks and tastes fantastic. Add meringue to your dry mixture and mix, quickly at first to break down the bubbles in the egg white (you really want to beat all the large bubbles out of the mixture, be rough! ), then mix carefully as the dry mixture becomes incorporated and it starts to become shiny again. Take care not to overmix, the mixture should flow like lava and a streak of mixture spread over the surface of the rest of the mixture should disappear after about 30 seconds. Place mixture in a piping bag with a 1cm round piping tip. Pipe heart shapes using a 1cm piping tip and piping fat 'V' shapes (see end of this post for a video example). Tap baking sheets carefully and firmly on the benchtop a couple times to remove any large bubbles. If you wish, you can decorate the shells with sprinkles to create a polka dot effect, I used the softer (not nonpareils) heart-shaped sprinkles. Leave to dry for about an hour, so that when you press the surface of one gently it does not break. This will help prevent any cracking and help the feet to form on the macs. These macarons seem to need a longer drying time than regular round ones as they are prone to cracking. Preheat your oven to 140-150°C (285-300°F), depending on your oven. Place on top of an overturned roasting tray or another baking sheet if your sheets are not professional grade, for better heat distribution. Bake for 20-25 minutes, depending on the size of your shells. Carefully test if the base of the shell is ready by gently lifting one and if it's still soft and sticking to the baking paper, then it needs to bake for a few minutes longer. Remove from the oven and cool on the tray for a few minutes, then gently remove from the sheet and place on a wire rack to cool completely. Make the cupcakes; Preheat oven to 180°C (350°F). Place sugar and butter in a food processor and pulse until smooth, then add juice, eggs, flour and vanilla and pulse until just smooth. (If you don't have a processor, cream butter and sugar in a large mixing bowl with an electric mixer at high speed, beat in eggs one at a time and then fold juice, flour and blueberries into the mixture until smooth.) Fold in blueberries with a spatula and then spoon into a 12-hole cupcake tray lined with papers. Bake for about 20 minutes or until cupcakes are golden brown and a skewer inserted into the centre of a cupcake comes out clean (ignoring blueberry juice). Remove from the oven and cool in tin for 5 minutes and then cool completely on a wire rack. Prepare the icing; remove the butter from the fridge 30 minutes before starting. Place in a large mixing bowl and beat at high speed, gradually adding icing sugar (and adding the milk and vanilla about halfway through) and beating until light and fluffy. Place in a piping bag, pipe on top of cupcakes and sandwich between macarons. 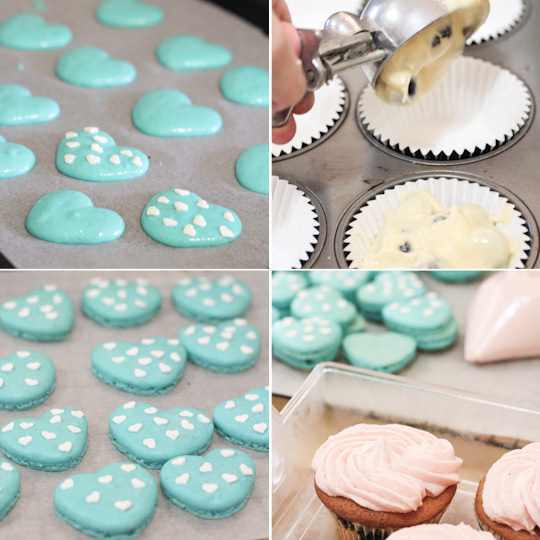 Place macarons on top of cupcakes and refrigerate for at least 2 hours, or overnight in an airtight container. Remove from the fridge and allow to come back to room temperature before serving. Can be stored in the fridge for several days. Another epic post!!! Everything looks soooo pretty especially the macs! Macaroni on a cupcake! I like! They are really pretty! 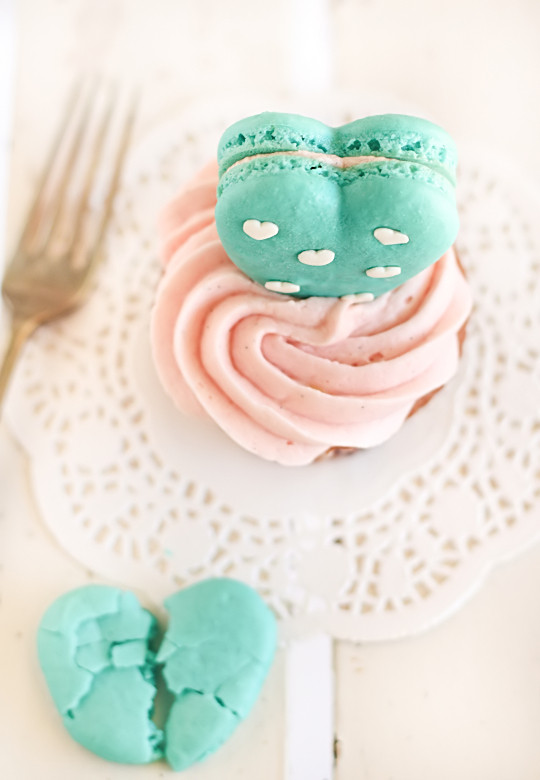 You really are the macaron MASTER ;) This is beautiful, like everything you do! Wow, these just look like heaven! 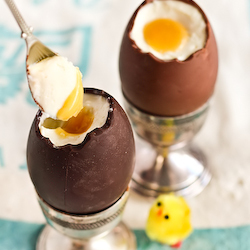 Bookmarking this page, I would love to try these some time! Aww they are absolutely adorable steph! I love the blue and white look. 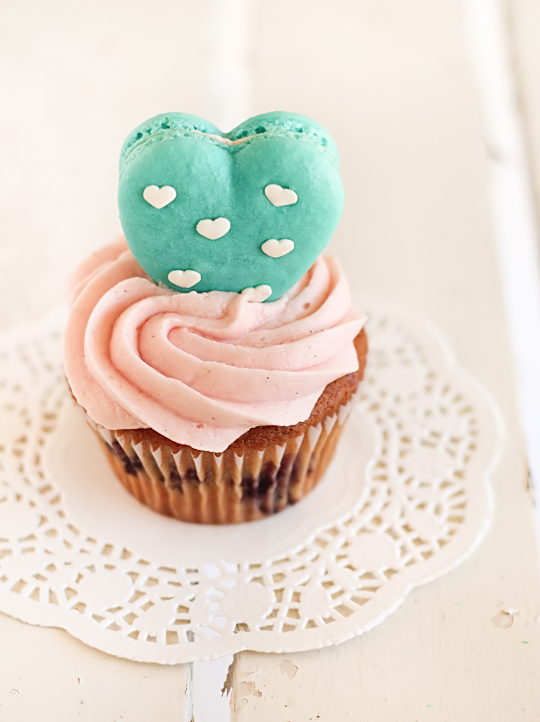 And how can you not be happy with a macaron on top of a cupcake? GORGEOUS! This is just beautiful. I love the colors. Beautiful! You are just amazing! ooh the pink and teal colour combination is so pretty! I love the white sprinkles, they make the heart macarons look even cuter. Awesome! 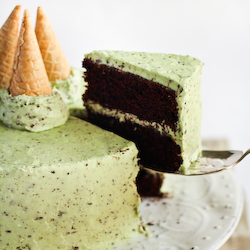 Just discovered your blog and loving everything you bake! YUM! Those heart macs are SO adorable!!! Thanks for all of your mac tips too. I've only tried making them once, and quite a lot of them cracked, so I'll be sure to read up on your tips for next time. Stunning and oh, so cute! What a taste treat! Hello..They look gorgeous and lovely..I want too eat them..I will try them..Nice to meet you..
Wow! They are absolutely gorgeous. 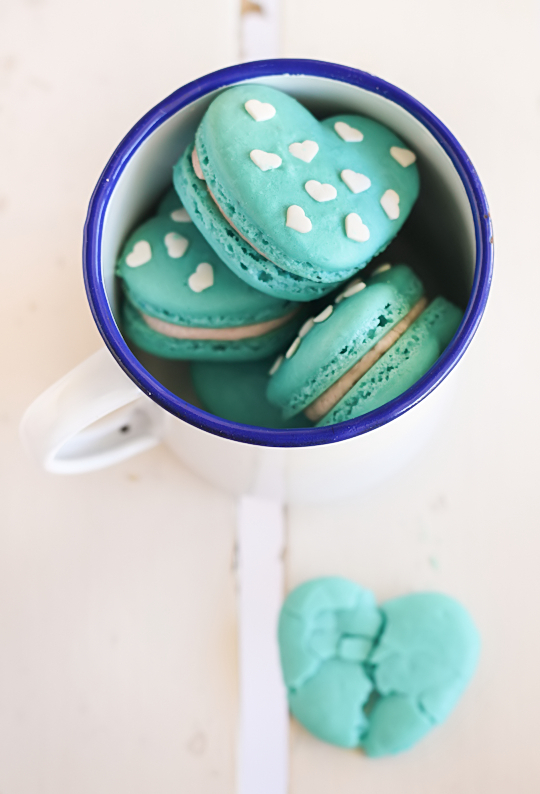 I absolutely love the blue macarons! You know what?! These would make the perfect valentines day pressie! I will attempt it one day! But of course, it would never compare to your amazing creations. Really beautiful pics! Dainty is exactly the word. I think the combination of blueberries and vanilla bean into a cupcake sounds absolutely delicious! 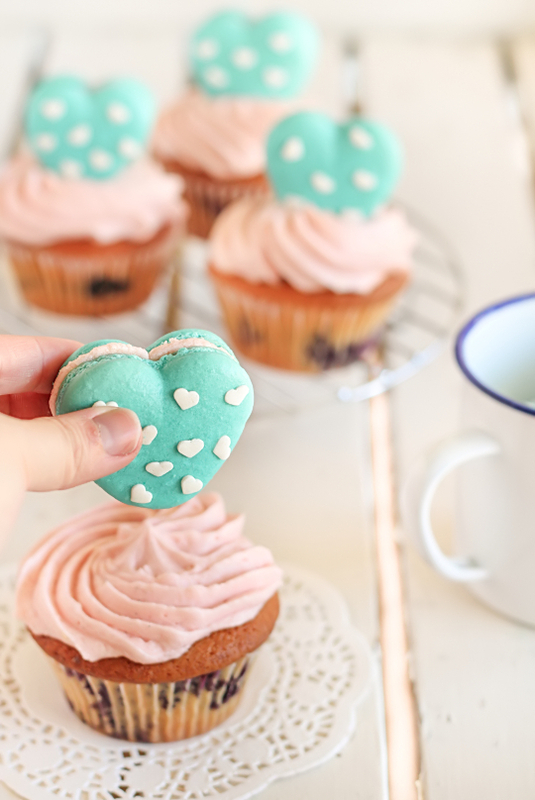 Not to mention that the macarons you've made to top off the cupcakes look lovely too (pink and aqua is one of my favorite color combinations!). Love this post! 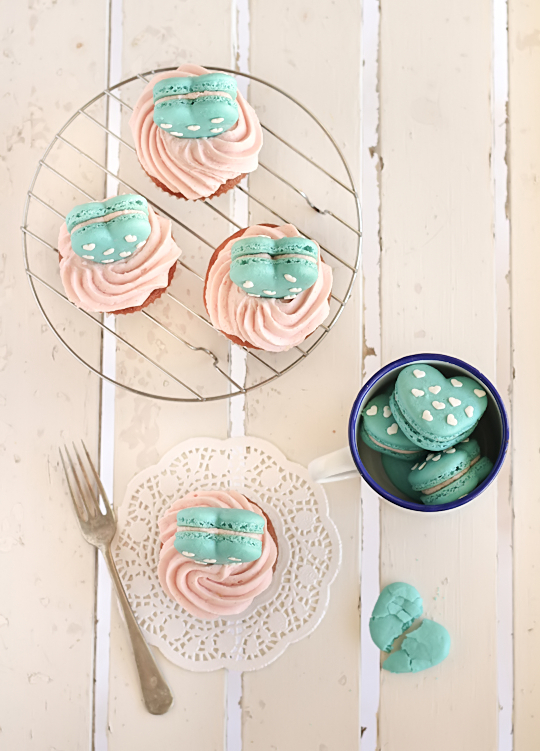 The cute factor of your heart Macarons, topping the shimmering pale pink icing is irresistible! Oh the cupcakes came out pretty. You make the prettiest Macarons. I do wish I had a little of your talent. Thank you for sharing. Those macs and cupcakes are so cute!! Gorgeous photos!! Love the delicate pastel shades...Pretty treats! Oh my those macarons are gorgeous! Love love love the colour too! Super girly and reminds me of wedding invites, actually! What a lovely blog, with all the things I like! 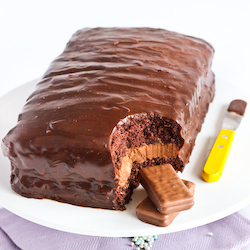 I found you via Sweet Eat and I am now following you, can I pin some of your photos? 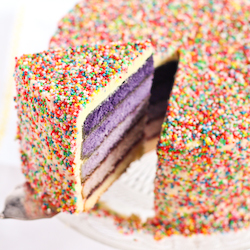 If you are looking for a basic cake recipe, try this one http://www.raspberricupcakes.com/2011/11/purple-ombre-sprinkle-cake.html without the food colouring. wow...this looks so darn cute. i'm so mindblown! LOL. I love your blog so much- you're an inspiration! amazing macaron!! macarons are my nightmare, i'm tring to find courage for bake it, yours are wonderfull!! These made my jaw droppped! Super duper cute and yummylicious!